Details of how decisions will be made by the Government-appointed Commissioners overseeing Rotherham Council have now been agreed. After a number of reports highlighted serious failings across the authority, an intervention package was announced by Eric Pickles, Secretary of State for Communities and Local Government, and saw commissioners appointed who will provide new leadership and take on all executive functions of the authority. An unprecedented step, the five commissioners have been appointed for a period of up to four years and could be in charge of the Council until March 2019. Each of the commissioners will consider significant decisions in their own areas of responsibility, working alongside elected members and senior managers. Councillors, local people and other interested parties will be invited to have their say on these decisions – to be known as "minded-to" proposals – and a final conclusion will only be reached once their views have been taken into account. Julie A Kenny CBE DL, chair and chief executive of growing Rotherham business, Pyronix Limited, is one of two supporting commissioners and has been given the lead on growing the local economy. Kenny outlined her role at a recent meeting of the Rotherham United Business Club. The Council had previously used a "strong" Leader and Cabinet form of executive which carried out all of the Council's functions that are not the responsibility of any other part of the Council, whether by law or under the Constitution. Executive functions include key decisions taken by the Cabinet that generally include decisions relating to incurring significant expenditure or are significant in terms of its effects on communities living or working in an area. Cabinet members were delegated powers to make decisions regarding council undertakings that were within their remit and a number of committees were used to deal with some of its functions. The existing delegation framework to officers will remain in place and Commissioner Kenny will take all decisions previously taken by the Cabinet Members responsible for planning, regeneration and development and future housing investments. Commissioner Kenny is to be informed of "any critical or untoward issues within the portfolio as well as maintaining an oversight of activities" and be kept up to date with progress of current or new regeneration, housing and transport projects. Commissioner Kenny will be in Rotherham around two days per week and will meet with Karl Battersby, strategic director of Environment and Development Services for general briefings once a week, in addition to any other issue related meetings which both may be attending. The next scheduled meeting for Commissioner Kenny is May 1 and key decisions include signing off the final version of the Rotherham Growth Plan. The Commissioners have also set out how they will work with elected members. Led by Council Leader, Cllr Chris Read, a new Advisory Cabinet is now in place. They will act in an advisory capacity only, in support of the Commissioners. 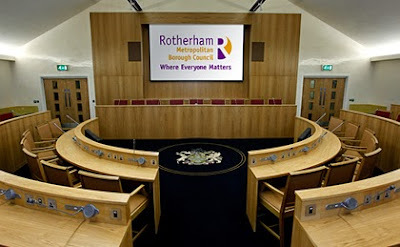 Commissioner Sir Derek Myers, Lead Commissioner at Rotherham Council, said: "These are unprecedented circumstances, working outside the usual rules of local democracy and decision-making, but it is absolutely crucial that we are open and accountable in delivering services to the people of Rotherham. We will be clear about what we are doing, and why we are doing it. "Each Commissioner has a different role and responsibility and, crucially, we can take decisions both as individuals and as a group. This gives us the ability to work in a way which is very different to the previous Cabinet system, i.e. without a rigid set of public meetings as a group – allowing for speedier decision-making to underpin progress across services. "I want to be clear however, that we will not take any decisions without the chance for councillors, local people and other interested parties to have their say, with the exception of those deemed to be urgent in the public interest." Under the new system interested parties have five days to put their views forward and Commissioners can take urgent decisions without the five day public consultation period if needed. The operation of the Planning Board is to stay the same. Regular reviews and reports are expected to result in a phased roll back of functions over the duration of the intervention. Commissioner Sir Derek added: "Our aim is to return Rotherham to a healthy democracy as soon as possible, and working with elected members throughout this process is crucial. We will consult with them, and we will listen - and together we will strengthen the local democratic process to underpin a strong future for this town."